The Largest Artery In The Human Body Is The? What Distinguishes Venus and Uranus From All Other Planets In Our Solar System? Arteries are the component of the human circulatory system that serve as the distribution mechanism for freshly oxygenated blood (except the pulmonary and umbilical arteries). Among all of our arteries, big and small, none is so central and important to our health as the aorta. 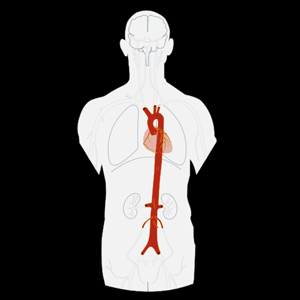 Located just left-of-center in our chest cavities, the aorta is the mother artery, if you will, that feeds all of the smaller secondary arteries in your entire body. Whether it’s the blood that delivers nutrients to your brain or the blood pooling under a bruise on your shin, only moments before it started the trip by passing through the aorta. The aorta isn’t just a sanguineous superhighway in humans, either, it’s a large and important artery in nearly all mammals. The massive blue whale, for example, has an aortic artery that is large enough to nearly fit a human head inside.